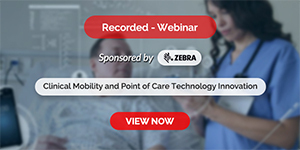 Healthcare organisations are spending significant amount of resources towards improving processes and adapting new technologies to improve patient care and overall organisational efficiency. While executing these change initiatives, management experiences many implementations related challenges in terms of employee resistance to accepting the change. The paper discusses existing change management models and presents an improved model with inclusion of different dimensions of goal specificity. Healthcare organisations are continuously working on improving their performance to improve patient care and organisational efficiency. In these efforts, many organisations are executing various efficiency and care improvement projects, which often require the implementation of new processes or technology related changes. These changes may result in process redesign, technology implementation, or even starting a new service or a product altogether. All of these changes need to be managed successfully for a project/program/service to achieve its goals/purpose. Goal setting theory suggests that conscious and specific goals lead to better task performance by creating situations for employees engagement; it mobilises efforts, direct attention, and encourages persistence and strategy development" (Locke & Latham, 1990). It is widely known that the major challenges associated with change management of any new initiative are closely related to the attitudes and behaviors of potential users, which often results in the resistance to accept the change (Aladwani, 2001). Change is an inevitable part of any performance improvement effort. To be able to survive and succeed in a highly competitive environment, it is very important for any organisation to improve their performance on a continuous basis. The process of change mostly depends upon the way leaders create it and also how it is presented by the managers. Unfortunately, in many cases, leaders themselves lack full knowledge of how the new concept is going to impact the organisation (Wilson,1992). Researchers reported that the failure rate of change management effort is almost around 70%. And, the reason for this failure is that organisational leaders are still unsure about the right recipe and right ingredients for successful change implementation (Balogen and Hope Hailey, 2004). This paper presents a model for change management which differentiates itself from other models by presenting the importance of goal specificity in change management. Existing change management models were reviewed to assess the weightage they have given to the goal setting and goal specificity. Over the years, many different models have been proposed to improve the implementation of the change in the organisations. Some of the popular change management models were reviewed to assess the weightage they have given to the goal setting and goal specificity. Change is described as a three step process in Lewin's model. The first step is ‘unfreezing,’ wherein the areas identified for change are prepared and existing procedures and processes are dismantled. This is also the most difficult step as it requires challenging the established processes and behaviors and involves most resistance from people. The second step is "Change" i.e. introduction of new processes and systems and acceptance of the change by the people. This is a long and time-consuming process and requires significant effort in terms of communication and motivation and in creating belief that change is for the better. The third step is "refreeze" after the change is widely accepted and new processes are in place. This step is important in making the change permanent so that the people and that part of the organisation do not revert to the old ways (Lewin, 1945). John Kotter developed an eight-step change management model to help organisations effectively manage change and transform the organisation (Kotter, 1995). Kotter’s organisational transformation model recommends to follow eight steps for successful change management: create a sense of urgency, create a coalition, develop a clear vision, share the vision, empower people to clear obstacles, anchor the change, consolidate and keep moving, and secure short-term wins to motivate the people. Kotter introduced his change management model as a guide to the leaders to effectively manage change and prevent errors in first place. It starts with creating urgency for change by presenting the need. The second step suggests to create cross-functional teams to lead the change. In the third step, it recommends developing vision and strategies to guide the change process to the teams. The fourth step is communicating the vision and setting the behavioral expectations. In the fifth step, it suggests that employees and team members should be empowered to bring changes, by changing systems and bringing in a new idea. The sixth step advocates creating short-term wins and rewarding the people for these wins. The next step is a consolidation of gains through appropriate changes to policies and procedures and involving more people. The eighth and the last step is the institutionalization of change by emphasising connections between new processes and behaviors and success. The model also recommends the development of succession plans (Kotter, 1995). In one of the change management studies, Mento and colleagues have developed a framework for successful change management. This framework is based on their experience at a Fortune 500 defense industry firm and on the lessons derived from three of the most famous change models; Kotter's strategic eight-step model for transforming organisations, Jack's tactical ten-step model for implementing change, and General Motor's seven-step change acceleration process model. This framework was developed to better understand and extract the common attributes of famous change models. The twelve steps from the framework can be summarized as: have a strong and creative idea, define the change initiative, evaluate the climate of change (necessary resources- sufficient trained staff and money), develop a plan, find a sponsor, involve the employees, communicate the impact of the initiative, prepare a team, find ways to motivate employees (by creating small wins), and have clear ways to measure the efforts (Mento, et al 2002). The models discussed above provide detailed steps for change initiation and implementation. However, none of the above models has given emphasis on having goal specificity or to have a clear detail picture of initial goal. 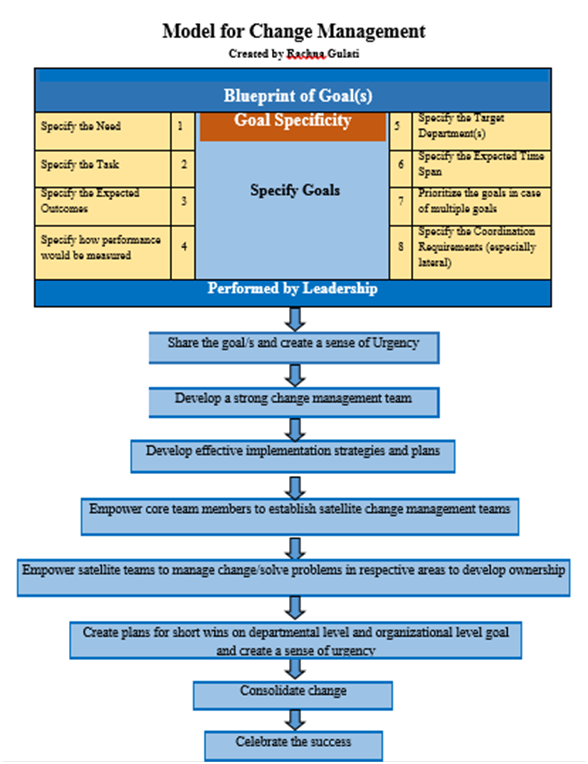 The paper discusses the need and importance of goal specificity in change management and presents an improved model. According to goal theory, every new idea or initiative should be started with clearly specific goals. These goals must be developed by the organisational or project leaders to create a clear picture of the idea they are exploring. Goal theory suggests that while developing and implementing these goals, it is important that leaders have some level of clarity inregards of; specific tasks they want to achieve, the expected outcomes, work actions required, and how performance is to be measured. This goal specificity will help in planning and determining the coordination and skill requirements, and predict the preparedness of the employees in terms of education and training requirements. The specific tasks and measures can be modified if the situation changes, but having some level of specificity in the initial goal setting stage can play a big role in achieving success in new improvement idea or change project. Also, clearly specified goals would reflect leaderships' commitment to the project, hence their role would not be limited to just providing resources. In addition, they will have clear understanding of desired outcomes, educational and training requirements of the employees, and measures of the performance. Looking at the various attributes of goal setting and goal specificity, it can be suggested that before any new project is started it is important for the leaders to have blueprint of their goal/s. This blueprint will provide a common thinking ground to the people that would be impacted by the change initiative. Often times, it has seen that different people interpret the change from different perspectives, which creates ambiguity and unnecessary fear among the employees. According to Kotter and Schlesinger (2008), the most common reasons people resist change are desires not to lose something of value and misunderstandings of new initiative and its implications. It would be much easier for leaders to communicate and educate employees if they themselves have clarity in regard of project goal/s. This will allow them to hire and involve the right skilled people right from the starting of the project. In addition, they can pre- plan for educational and training support requirements for the employees those who are less qualified and not already prepared for the new initiative. According to the study conducted by Anderson et al(1985), the factor in successful change efforts was the presence of a championing leadership, leaders who had clearly specified goals and fought persistently for their goals and ideas. The first step is to develop a blueprint for a goal by leadership. It is very important for leadership to have clarity with respect to the identified goal. The clarity or specificity entails eight sub-steps which ensure that the project goal is not only connected to the internal or external need but also has following components specified: Assessing the need for the change; Assessing the relevant tasks; Expected outcomes; Performance measures; Target area or department/s involved; Time-span; Prioritization of goals; Coordinated requirements. These steps set this proposed model apart from all other change models. No other change model has emphasized the need of goal specificity. The goal specificity not only helps leadership to define goals with a high degree of specificity but also help in continuity in case of any planned or unplanned changes in leadership. Furthermore, this enables leadership to maintain consistent communication and focus on initial goals and expected outcomes. The second step is for leadership to communicate and share the need for the change and the expected benefits of the specified goal. To implement any change, it is important that everyone involved feel the need for a change. This step would require honest communication with people and discussion on key reasons for change. It is important that leaders also discuss potential threats and opportunities. The involvement of people will also help in developing a sense of ownership and thus reducing the resistance and enhance the acceptance for the change. This step is similar to Kotter's first step i.e., developing the need for urgency which may help motivate people initially and help to reduce the resistance to the change. The third step focuses on developing a strong change management team including not only the team leaders but also the strong proponents of the change. It is important that team consists of a good mix of people representing all the departments which are going to get impacted. The team should preferably be broad based and cross-functional in nature. This team can help to sustain and maintain the momentum for the change. This step closely aligns with Step-2 of Kotter's model. In this step, the team re-evaluates the blueprint of goal and update the tasks, targets, goal priorities, requirements, and performance measures as required. Following this, the team develops strategies and translate these strategies into actionable plans for the department(s). The plans further define the required tasks and responsibilities along with individual activity time-frames and targets. The team members are empowered to establish satellite teams in their respective departments /functions to spread change. The role of these satellite teams is to implement the change plans, solve problems and resolve challenges. This will create ownership and will help in identification of innovative solutions considering the specific needs of the function and department. These teams will continue to be supported by the core team and thus will still provide a way to share the lessons learned amongst various departments/functions. It is important to create short-term specified targets for individuals, teams, and departments. The attainment of the short term targets will help motivate the team members. The achievement of specified targets, rewards and recognitions will help in winning the people resisting the change and it will also keep the high performers motivated. This step is based on the sixth step of Kotter's model. It is important to continue measuring the progress of the change implementation in terms of specified performance measures and verify the attainment of the specified outcomes. Once the attainment of the specified outcomes is verified, the change needs to be consolidated. The focus needs to shift to spread the change and also the lessons learned. It is also prudent to capitalize on the momentum and redeploying some of the team members to relatively lower performing areas. This is also the time to reward the individuals and teams. This step is a combination of the eleventh step of Mento's model and seventh step of Kotter's model. This is the last step with an objective to reinforce the change by making it integral part of the culture and processes. The project leadership must share, recognize, and celebrate the attainment of the specified outcomes at institute level. The visible support of leadership is a key to institutionalisation of change. This step is based on the eighth step of Kotter's model. A brief review of existing change management model shows that none of the existing models gave much importance to goal specificity. Mento and colleague in their 12 step change model did suggest that a change starts with having a creative idea and then the next step is to define the change initiative. However, they didn’t give much emphasis on creating a detailed picture of project goal. Clearly specified goals would reflect leaderships' commitment to the project, and their role would not be limited to just providing resources. The suggested model emphasizes the importance of creating blueprint of project goal, provide detailed components of goal specificity, which followed the steps of change implementation/ management. The proposed model emphasizes on creating blueprint of project goal. The model suggests that with clear understanding of goal, project leaders will be able to plan well for performance measures and desired outcomes, and better prepare employees for the upcoming change. • Aladwani, A. 2001. Change management Strategies for Successful ERP Implementation. Business Process Management Journal, 7, (3), 266-275. • Anderson, D.G., Phillips, J.R. Kaible, N. 1985. Revitalizing Large Companie. Work Pap Cambridge, MA. Massachusetts Institute of Technology, 35 pp. • Balogun, J. and Hope Hailey, V. 2004. Exploring Strategic Change, 2nd edn (London: Prentice Hall). • Kotter, J.P. 1995. 'Leading Change', Harvard Business Review, March-April. • Lewin, k. 1945. Field Theory in Social Science: Selected Theoretical Papers, Ed. Dorwin Cartwright, Boston, Massachusetts: MIT Research Center for Group Dynamics and New York: Harper and Brothers Publishers. • Locke, E.A.,& Latham, G.P. 1990. A Theory of Goal Setting and Task Performance. Englewood Cliffs, NJ: Prentice- Hall. • Mento, A.J., et al. 2002. A Change Management Process: Grounded in Both Theory and Practice. Journal of Change Management; August; 3, 1; ABI/INFOM Global, Pg- 45. • Wilson, D.C. 1992. A strategy of Change (London: Routledge). 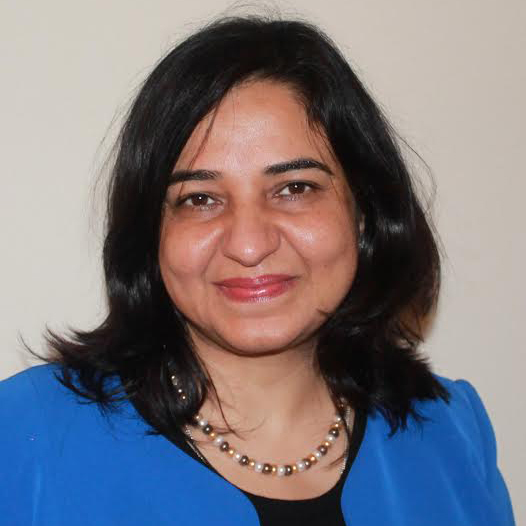 Rachna Gulati currently is a management consultant at NeoSage solutions in the United States. From past 10 years, she has been contributing towards healthcare performance improvement and strategic planning. Some of her accomplishments include her Innovative models for change management, organizational vision creation and its strategic implementation, and the training reference guide to simplify EMR training and implementation.